The Global Volcanism Program has no activity reports for Tseax River Cone. The Global Volcanism Program has no Weekly Reports available for Tseax River Cone. The Global Volcanism Program has no Bulletin Reports available for Tseax River Cone. 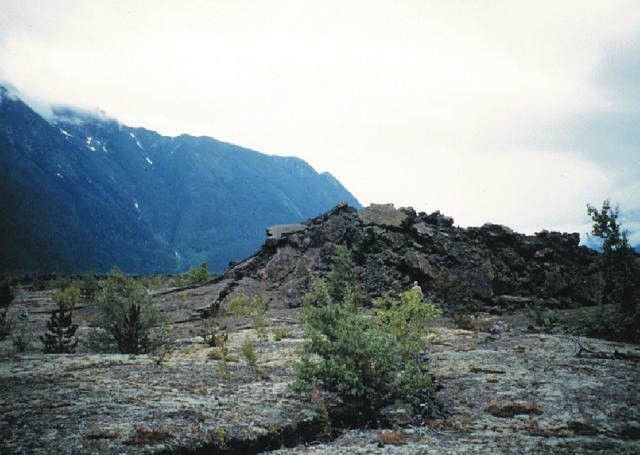 The basaltic Tseax River cinder cones (Aiyansh volcano) at the southern end of the Stikine volcanic belt have been the site of some of the youngest volcanic eruptions in Canada. Nested cinder cones lying along a tributary of the Nass River were the source of a lava flow that traveled into the Tseax River, damming it and forming Lava Lake. The flow subsequently traveled 11 km north to the Nass River, where it filled the flat valley floor for an additional 10 km. Native legends of the Nisga'a People tell of a prolonged period of disruption by the volcano, including the destruction of their village on the Nass River and the death of some people from "poison smoke." The vent was active at least twice (625 and 220 radiocarbon years ago) and other remnants of lava flows exist in the area, which was designated the Nisga'a Memorial Lava Beds Provincial Park in 1993 (Hickson and Edwards, 2001). Higgins M D, 2009. The Cascadia megathrust earthquake of 1700 may have rejuvenated an isolated basalt volcano in western Canada: age and petrographic evidence. J. Volcanol. Geotherm. Res., 179: 149-156. Sutherland-Brown A, 1969. Aiyansh lava flow, British Columbia. Can J Earth Sci, 6: 1460-1468. Wuorinen V, 1978. Age of Aiyansh volcano, British Columbia. Can J Earth Sci, 15: 1037-1038. There is no Deformation History data available for Tseax River Cone. There is no Emissions History data available for Tseax River Cone. The Tseax River cinder cones (Aiyansh volcano) at the southern end of the Stikine volcanic belt have been the site of some of the youngest volcanic eruptions in Canada. This photo shows a tumulus in the middle of a broad lava plain in the Nass River valley produced by the Tseax River flow, which traveled 22.5 km. The flows are the prime attraction of the Nisga'a Memorial Lava Beds Provincial Park. The volcanic field erupted at least twice (625 and 220 radiocarbon years ago), and activity was noted in tribal legends. Photo by Ben Edwards (Dickinson College, Pennsylvania). There are no samples for Tseax River Cone in the Smithsonian's NMNH Department of Mineral Sciences Rock and Ore collection. Large Eruptions of Tseax River Cone Information about large Quaternary eruptions (VEI >= 4) is cataloged in the Large Magnitude Explosive Volcanic Eruptions (LaMEVE) database of the Volcano Global Risk Identification and Analysis Project (VOGRIPA).